Observed at Tambach, Kenya, Africa. December 2012. Length about 3 mm. 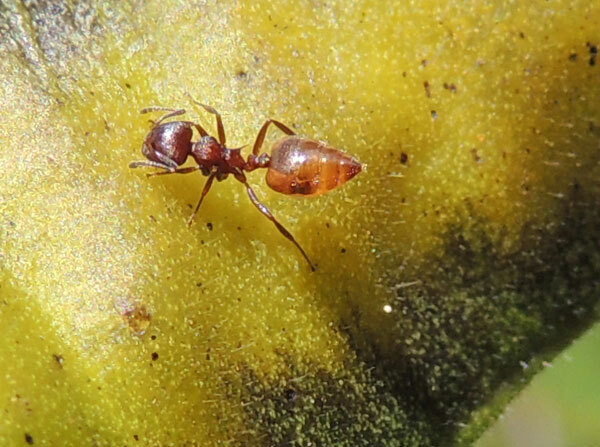 This one was feeding on plant sap oozing from injuries caused by piercing-sucking insects on Mauritius Thorn. Crematogaster is a large genus of small ants that have a world-wide distribution and are easily recognized. Most are smaller than 4mm and have a tear-drop or heart-shaped abdomen that can be readily rotated and bent. They are very often encountered on trees and shrubs where they prey on small insects and feed also on sugary substances.